Paper project is a GTK3 and icon theme suite inspired by Google’s material design guidelines. They are developed by Sam Hewitt, the man behind the Moka icons project. 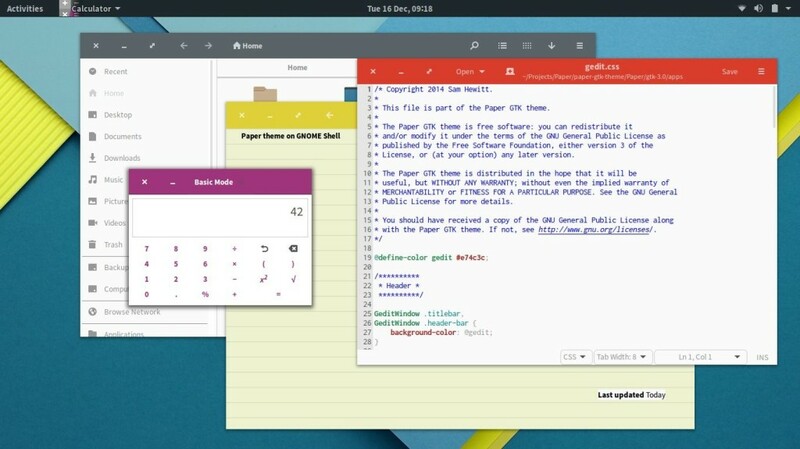 Paper started as a single GTK3 theme. It’s developed primarily for GNOME 3 and other GTK3 desktops. Its design is mostly flat with a minimal use of shadows for depth and looks really beautiful in desktops that make use of the GTK3 headerbars/client-side decorations (e.g. Gnome Shell). Paper icon theme is under serious development. The GNOME icon theme is the fallback set for missing icons. The developer has created a daily build PPA, available for Ubuntu 12.04, Ubuntu 14.04, Ubuntu 14.10, Ubuntu 15.04 and derivatives. Since the icons & theme are under-development, you will receive updates (changes or fixes) from PPA via Software Updater. If you don’t want to add PPA, grab the .deb packages from ppa page and install them via Software Center. Once installed, apply the themes via Gnome Tweak Tool or Unity Tweak Tool (both are available in Software Center). NOTE: Since the paper icon theme is under early stage, please report issues here. i have installed the theme but i’m not able to get different colors for different windows as shown in the image . please help me . Hi! Will this work on elementary OS luna? The combination of designs would be beautiful I think! Some one has tried the theme in eOS Freya which works great! I’m developing an application using glade ui designer and pygobject. How can I include the material theme in my design.